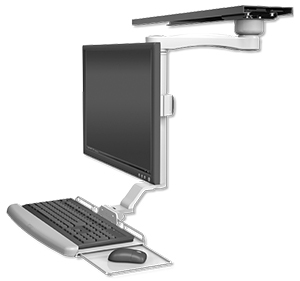 Make use of wasted space with ICW’s Under Cabinet Monitor and Keyboard Workstation. This model mounts beneath overhead cabinets, pulls out when needed and folds up and out of the way when not in use. A unique feature of this arm is its ability to slide horizontally on a 28” (71.12 cm) track for easy positioning. A compact ball joint enables this arm to fold up tightly under the track.